Father, you revealed yourself to us through the preaching of your apostles Simon and Jude. By their prayers, give your Church continued growth and increase the number of those who believe in you. Grant this through our Lord Jesus Christ, your Son, who lives and reigns with you and the Holy Spirit, one God, for ever and ever. Amen. However meagre in details is the history of these glorious apostles, we learn from their brief legend how amply they contributed to this great work of generating sons of God. Without any repose, and even to the shedding of their blood, they "edified the body of Christ"; and the grateful Church thus prays to our Lord today: "O God, through the work of the apostles you have spoken your Word of love, your Son, into our world's deafness. Open our ears to hear; open our hearts to heed; open our will to obey, that we may proclaim the good news with our lives." St. Simon is represented in art with a saw, the instrument of his martyrdom. St. Jude's square points him out as an architect of the house of God. 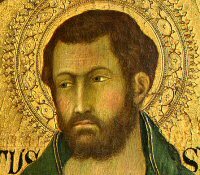 St. Paul called himself by this name; and St. Jude, by his Catholic Epistle, has also a special right to be reckoned among our Lord's principal workmen. But our apostle had another nobility, far surpassing all earthly titles: being nephew, by his father Cleophas or Alpheus, to St. Joseph, and legal cousin to the Man-God, Jude was one of those called by their compatriots the brethren of the carpenter's Son. We may gather from St. John's Gospel another precious detail concerning him. In the admirable discourse at the close of the last Supper, our Lord said: "He that loveth Me, shall be loved of My Father: and I will love him and will manifest Myself to him." Then Jude asked Him: "Lord, how is it, that Thou wilt manifest Thyself to us, and not to the world?" And he received from Jesus this reply: "If any one love Me, he will keep My word, and My Father will love him, and We will come to him, and will make Our abode with him. He that loveth Me not keepeth not My word. And the word which you have heard is not Mine, but the Father's who sent Me." Patron: Desperate situations; forgotten causes; hospital workers; hospitals; impossible causes; lost causes; diocese of Saint Petersburg, Florida. Symbols: Bearded man holding an oar, a boat, boat hook, a club, an axe or a book; nearly every image depicts him wearing a medallion with a profile of Jesus, and usually with a small flame above his head; often carries a pen or sits at a writing location to make reference to the canonical Epistle; sailboat; inverted cross; square; halbert; club; loaves and fish; long cross; knotted club; boat hook; fuller's bat; lance; saw; flail; closed book; shield: red with sailboat with a cross on the mast. Patron: Curriers; sawmen; sawyers; tanners. Symbols: Boat; fish; man being sawn in two longitudinally; fish and book; oar; saw; two fishes; lance; fuller's bat; axe; cross; saw and oar saltire; fish on a boat hood; sword; shield: red background with two oars and a hatchet. Traditionally Christians used to begin to prepare food such as bread of the dead and soul cakes for the feast of All Souls beginning on this day. In some areas people would beg for ingredients to make these cakes on this day.